Neglect is a type of psychological child abuse that can have serious, long-term effects on a person’s life. About 1,500 children die from neglect or abuse every year, according to the American Psychological Association, or APA. If you suspect that a child is being neglected or has related behavioral problems, talk to a physician or seek help from your local law enforcement or child protection agency. Children who endure neglect often have difficulty sleeping, problems functioning at school, eating disorders, poor growth, anger issues, behavior problems and emotional issues. Neglected children often display rebellious behavior and have anxiety or depression, according to the University of Maryland Medical Center. 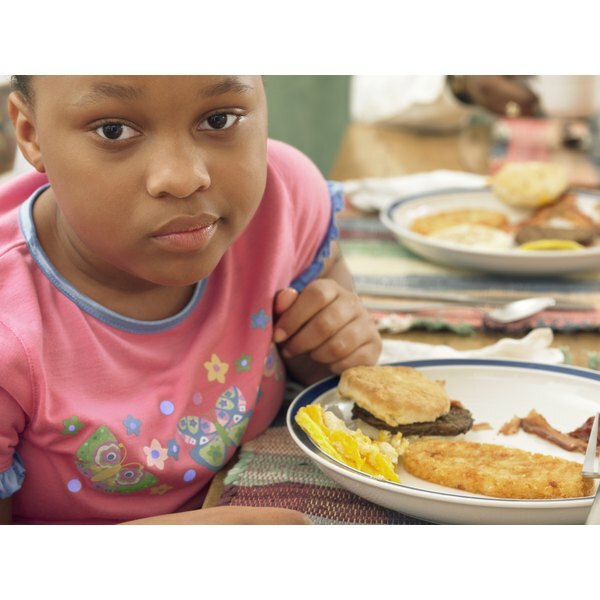 Neglect occurs when a child doesn’t receive adequate clothing, food, medical care, housing or protection, according to the University of Michigan Health System. Neglected children typically don’t receive these essentials because their parents or caretakers intentionally don’t provide them. Exposing a child to violence between adults and disregarding the child’s welfare are also forms of neglect. A child who lives with a caregiver or parent with depression, anxiety, substance or alcohol abuse, financial stress or insufficient parenting skills is at a greater risk for suffering neglect than other children, according to the Mayo Clinic website. Single parents and parents who are suffering from or perpetuating domestic violence are also more likely to neglect their children. Extreme stress, poverty and mental illnesses can increase the risk of child neglect in a home, according to the University of Maryland Medical Center. Also, children who have physical or mental disabilities and children belonging to families with several children under the age of 5 have a greater risk of neglect and abuse. Neglect can cause serious psychological and behavioral problems, according to the APA. A neglected child can suffer from post-traumatic stress disorder, depression, anxiety and many other psychological disorders that can lead to behavioral issues. Neglected children can develop behavioral problems like rebelliousness, self-esteem issues and difficulty at school, according to the University of Maryland Medical Center. When a child experiences abuse or neglect, he might withdraw from friends, do poorly at school, run away, develop a fear of adults or have frequent absences from school, according to the Mayo Clinic site. You might also notice that the child has poor hygiene and displays either extreme aggression or indifference and passivity. Child neglect and abuse can lead to serious, life-long effects. Some children can even die from neglect. Neglected children can develop learning disabilities, substance abuse, eating disorders, personality disorders, severe depression, suicidal tendencies, and difficulties with relationships and trust. Abused or neglected children also can grow up to become child abusers themselves, according to the University of Maryland Medical Center. Be aware of signs of child neglect, such as poor hygiene, frequent absences from school, changes in behavior and poor health. If you suspect that a child is being neglected or abused, contact your local police or child protection services immediately, according to the University of Michigan Health System. In nearly all areas, you can report your suspicions anonymously. A neglected child might need therapy from a licensed practitioner, according to the University of Maryland Medical Center. Parents who abuse or neglect their children also might need therapy and parenting classes. Identifying and stopping the neglect or abuse as soon as possible can minimize the long-term behavioral, psychological, emotional and physical effects, according to the APA.